If you’re a private buyer looking for a nearly new, Motability auctions are becoming an increasingly good place to shop. Not everything is a staggering bargain, but the Motobility fleet is the biggest in the country and for cashflow reasons it has to move dead stock. The 3k mile, mark-free metallic blue 2004/54 Smart Roadster in the photo had a CD and leather seats and a nice set of alloys so at £7,600 was a good private buy if not such a good one for the trade. A 1,458 mile 05 reg Grand Scenic 1.6 7-seater represented a fair old saving at £9,500. A 14k mile 2004.54 and immaculate new shape Astra 1.8 Life full auto made sense at £8,000, as did a 3k mile 2004/54 Zafira 1.6 Life 7-seater. 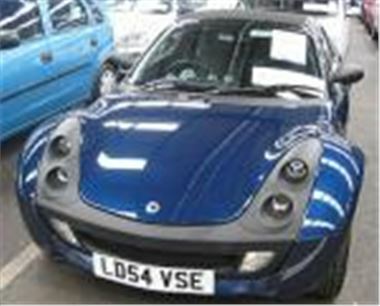 A 226 mile virtually new 05 reg Renault Modus 1.6 Dynamique automatic ran out of bids at £7,700. £10,950 wasn;t quite enough for a 6k mile 2004/54 Corolla Verso 1.8 MMT T3 7-seater. But how about £7,400 for a 2k mile 05 reg (old shape) Focus 1.6 Zetec 3-door auto? Next door, a Bank of Scotland 15k mile 2004/54 Rover 75 2.0CDT Connoisseur with a badly fitting bonnet sold for £9,600, a 17k mile 2003/53 MG ZT 180 sold for £8,400, a 9k mile 2004/54 Rover 75 1.8 Connoisseur didn’t sell for £7,700, a 1,700 mile 2005/54 reg MGZR 105+ 5-dr sold for £6,250 and a bright red 22k mile 02 reg MGTF 135 saw strong bidding to sell for £7,050. Not as strong as a 10k mile spotless 04 reg Mazda MX5 1.8 Euphonic with unkerbed alloys that romped away to sell for £11,450. Back down to earth a 103k mile 02 reg BMW 525d SE with leather that had been there for a few weeks sold today for £8,700, a bright red 55k mile 02 reg 320d SE with minor front bumper damage sold for £9,600.